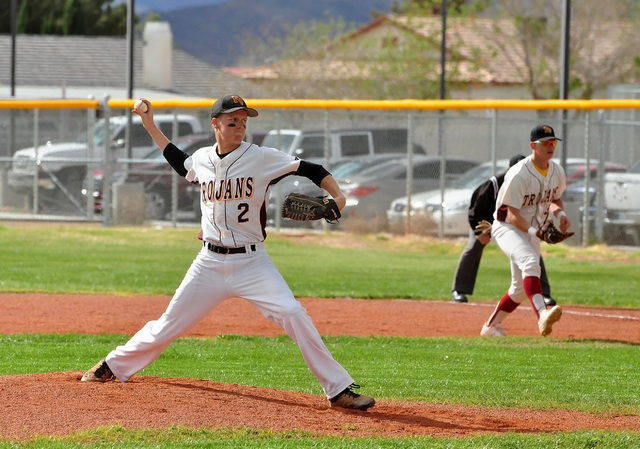 Pahrump Valley High baseball finds themselves in a rough spot, starting off the season in league at 1-3. According to Trojans coach Brian Hayes, his team just needs a little time. Already nearing the halfway mark, the team finds themselves in fifth place and one game out of a playoff spot, which is fourth place. Does the team have time? With a short season, the team has to come together soon to make the four-team cut for the playoffs. This upcoming week could make or break this young Trojans team. The team played against Cheyenne yesterday, which was past deadline and then Mojave on Thursday. Pahrump is tied with these teams currently. Is this do-or-die time for Pahrump? Hayes wouldn’t call it do or die. “Cheyenne and Mojave are not necessarily must-win, but if we don’t win, we will be on the outside looking in,” he said. With a team mostly of sophomores and juniors, the Trojans have had a rough go at putting together a full game. A game where the errors are under 5, the team is hitting over .300 and the pitching ERA is under 3. That is where Hayes likes to operate, but his young team has only been able to put that into practice against one conference team, Western. In the last two conference games, the Trojans have managed to bring down the fielding errors. Against Clark, the Trojans had six errors. Then against Spring Valley they brought that number down to two and one against Sierra Vista. “Our pitching and defense has been much better as of late and still is the backbone of our team,” Hayes said. In the last two games, the pitching improved for the Trojans. In the Spring Valley game, the Trojans allowed 13 runs but in the game against Sierra Vista the team allowed only one run. The Trojans do need to produce more runs. Aaron Fuentes said his team calmed down a lot. In the game against Sierra Vista he said the team was guessing too much. With the hitting and fielding errors apparently under control, the team will turn to its pitchers for that final element. At the moment, the team has an earned run average of 4.63, which is above the national average of just over 3. The Trojans have one senior pitcher with a lot of experience, Kyle Kral. After that, they have to rely on youngsters to settle down and do the job. Kral has won 2 and lost 2. He leads the team in wins and strikeouts with 26 in 24 innings pitched. His ERA is 2.92. Josh Ferrer is a junior and has 22.1 innings with 24 strikeouts. His ERA is 5.64. Then there is sophomore Garret Lucas, who has 19.1 innings pitched, 19 strikeouts and an ERA of 3.26. Hayes will keep turning to these guys to get the job done. The teams to beat in the Sunset League are the following: Faith Lutheran (11-2, 4-0), Spring Valley (9-4, 3-1), Sierra Vista (5-10, 3-1) and Clark (7-6, 3-1). For the Trojans, they need to beat Clark and Sierra Vista the second time around and beat Mojave (12-4, 1-3) and Cheyenne (1-4, 1-3) this week.